We invite you to join us through volunteering at one of our four centers (West Suburban Center in Geneva; North Suburban Center in Park City; Northwest Center in Rockford; South Suburban Center in Joliet), becoming a financial or food donor, and helping us spread the word about hunger in our community on Facebook and Twitter. For no one in Northern Illinois to be hungry. Community: We collaborate with our team and partners to exceptionally serve one another and our neighbors. We honor diversity and celebrate our unique gifts and perspectives. Humility: We are humble and self-aware. We know when to ask for and accept help. Impact: We create positive change by focusing on what’s most important to our mission. Empowerment: We trust and support each other to get the job done and to do it well. Accountability: We take ownership for our performance and honor our commitments. Transparency: We share information, as appropriate, openly and honestly through candid conversation. A new study by Northern Illinois Food Bank and Feeding America shows that nearly 600,000 people in northern Illinois turn to food pantries and meal programs to feed themselves and their families. The Hunger in America 2014 study is Feeding America’s sixth extensive study of hunger. 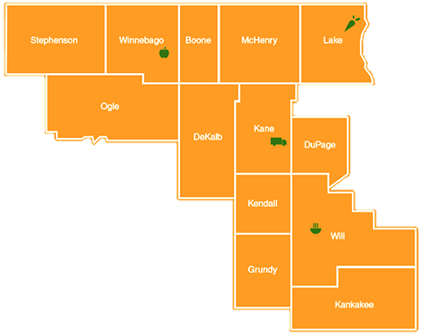 As a member of the Feeding America network, Northern Illinois Food Bank participates in this study to better understand the needs of our hungry neighbors. 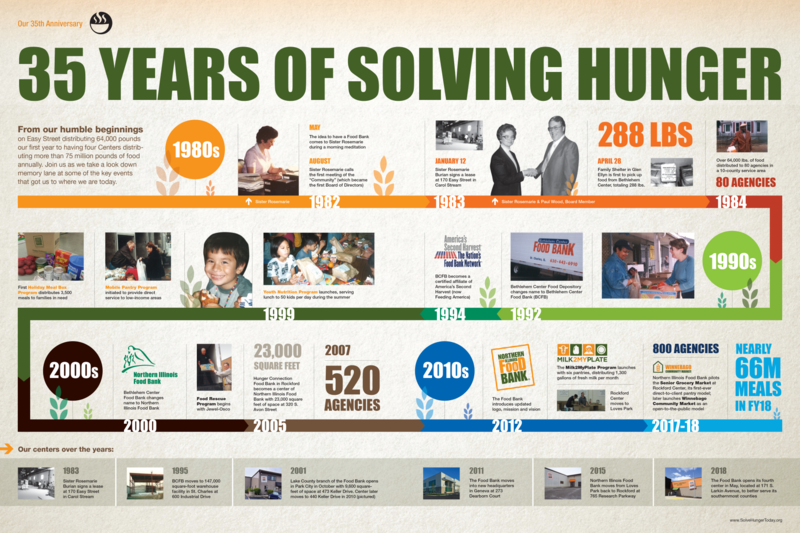 Completed every four years, the study surveys the food pantries and feeding programs in the Northern Illinois Food Bank network and the people who seek food assistance from them. Children under age 18 make up 36 percent of our hungry neighbors, while seniors age 60 and older make up nine percent. Among all hungry neighbors, 40 percent identify as white, 33 percent identify as Hispanic or Latino and 17 percent identify as black or African American. 66 percent of households that use the Food Bank’s services have incomes that fall at or below the federal poverty level. 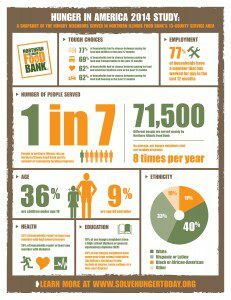 78 percent of people who use the Food Bank’s services have a high school diploma or general equivalency diploma, and 30 percent have completed some college, earned a business, trade or technical degree or completed a four-year college degree or higher level of education. The study shows that clients are making tough choices. Based on the report, 77 percent of households the Food Bank serves had to choose between paying for food and utilities in the past 12 months, and 62 percent had to choose between food and paying for medicine/medical care in the past 12 months. We also learn from the report that hungry neighbors are struggling with health issues: 53 percent of households report at least one member with high blood pressure, while 26 percent of households have at least one member with diabetes.